A black and white flapper inspired ensemble accessorized with a lace headband ropes of pearls and brightly colored floral parasol. The roaring '20s are on their way back to Governors Island. 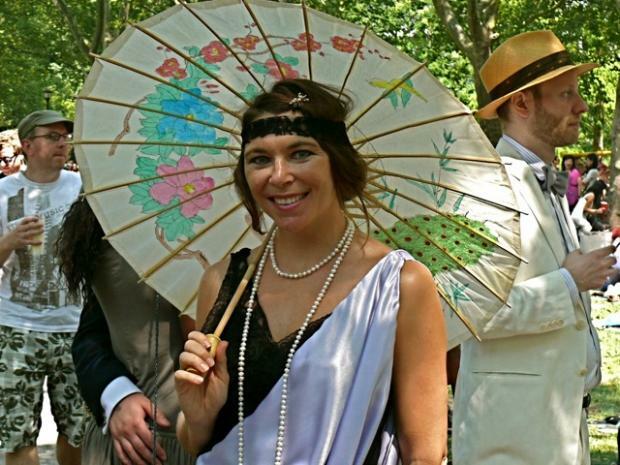 The Jazz Age Lawn Party — a celebration of the bygone era's flapper fashion, swinging music and prohibition cocktails — is taking over the island on June 11 and 12, as well as Aug. 26 and 27. The summer festival, now in its 12th year, has become one of the island's most popular — and quick to sell out — events. Those who take the ferry back in time will find a host of old-timey activities, including live big band music, a Charleston dance competition, and a place to take vintage photos — as well as plenty of space to dance, drink and picnic. The party runs each day from 11 a.m. to 5 p.m. each day. Tickets, which can be purchased here, range from $45 for general admission to $5,000 for a luxury package that includes drinks, food, a private dance floor and tent for you and 15 friends.